Marc Spijkerbosch has been delivering public art around New Zealand and overseas for over 25 years. 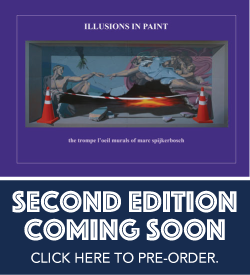 A multi award-winning artist experienced in the civic and commercial application of the illusion genre, Marc’s work enjoys international acclaim. In the last 25 years, Marc has painted some 400 trompe l‘oeil works for hotels, restaurants, residential, civic and corporate clients. His work sees him travel extensively around New Zealand, with murals now in Australia, India, and the United States. Using the trompe l‘oeil genre, Marc won the prestigious judge‘s award at the International Muralfest, Sheffield,Tasmania in 2008, 2009 and again in 2010. Marc‘s home and studio are on the shores of Lake Rotoma, Bay of Plenty, where he lives with his wife and three children. The trompe l‘oeil device has a tremendous inherent ability to engage the viewer. It is a bridge; a fascinating threshold that connects the actual with the imagined. Marc has worked with cities and communities across New Zealand and abroad. His ‘hands on’ knowledge and depth of experience in the public art field has made a valuable contribution to the City of Rotorua during his tenure as Community/Public Arts Advisor. 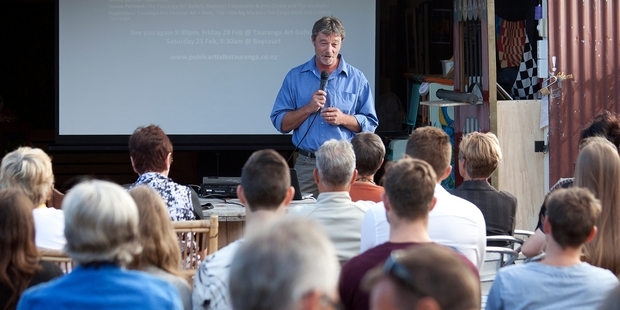 During this time, Marc has been responsible for a range of public art initiatives including the creation of the ‘Sulphur Lake Sculpture Trail’ and his successful implementation of the first ‘percent-for-arts’ policy in New Zealand – an internationally recognized mechanism for funding public art. Marc has an inherent ability to connect community with Council and stakeholders. He is frequently engaged by organizations, community groups and learning institutions to share his colourful experiences and successes – offering fresh insights and energy into the public art arena.